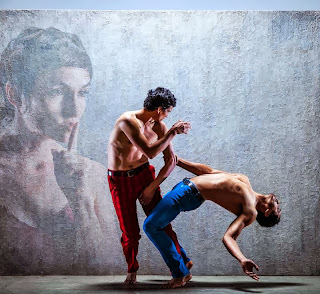 Dance Commentary by Heather Desaulniers: "Hush"
Every time I see Joe Goode Performance Group, I am struck by how it transcends current notions of choreographic genre. While the work could be described as dance theater, mixed media, performance art, and/or interdisciplinary, those categories also aren’t quite sufficient. Maybe Joe Goode Performance Group is part of a new genre, something we don’t have a name for yet. One thing is for sure, any piece from Joe Goode and his company certainly has plenty of artistic sustenance. 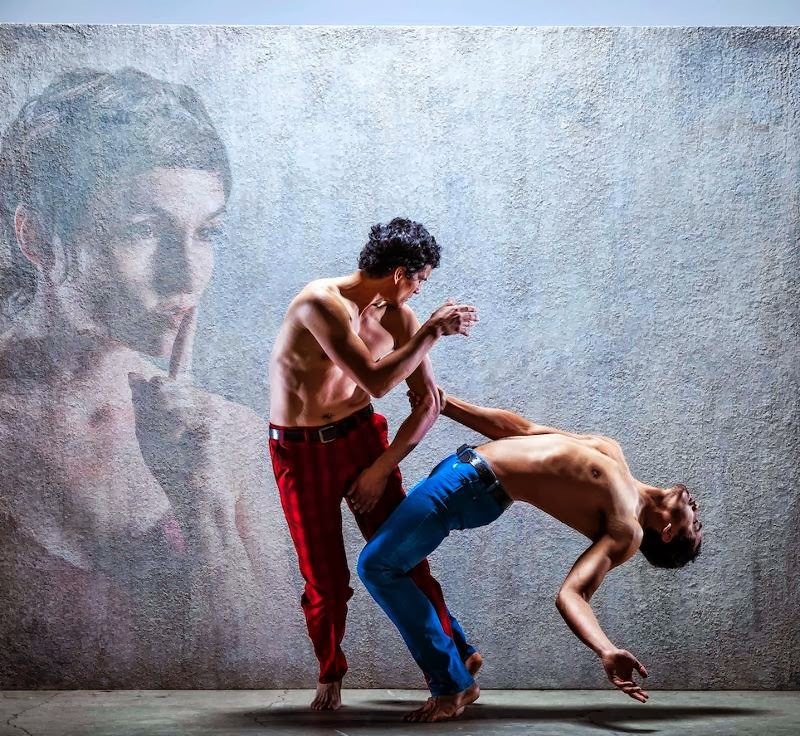 “Hush”, their newest work, is no exception. A narratively-driven, movement-filled, collaboratively-minded event, “Hush” is all about humanity’s in between spaces. “Hush’s” primary message is the porous space between the individual and the group. Throughout the seventy-minute production, we see many of its characters work through emotionally-charged, deeply private and in one case, horrifically traumatic personal experiences. Yet, their journey also occurs within a greater, collective context, involving the people around them. An early set of pas de deuxs established this point in the opening moments. Three couples cycled through contact-improvisation style duets, while constantly changing partners. Each pairing looked familiar, comfortable and purposeful, reflected in the egalitarian movement – each dancer was part of the other’s existence, and as such, was woven into every personal story. Arising from this, and in multiple other scenes, was a complicated mix of comfort and intrusion. On the one hand, it was reassuring for the characters to not be alone, yet at the same time, there was an invasion into their reality. Sound, a major collaborator in “Hush”, was also an in between entity. The music, composed by Ben Juodvalkis, is neither major nor minor. Instead it shifts back and forth between the two and typically settles in a more modal place. Performed by Juodvalkis, along with multiple members of the cast (whose musical acumen is really quite astounding), the score hovers with surprising harmonies, unexpected cadences and rare resolutions. The sound effects, by Sudhu Tewari, also played a dual part in “Hush”. And, aside from their significant artistic role, it must be noted that the sound effects were incredibly cool, super inventive and extremely funny at times. Of course, the sound effects amplified what was occurring naturally and what was being mimed on stage. From walking to pouring drinks to closing doors, they brought “Hush” to a new dimension, almost like an audio 3-D. But in addition, they contributed in a very real way to the narrative. In an otherwise quiet, yet violent pas de quartre, it was the sound effects that demonstrated the notion of brokenness to the audience. With the soundscore’s crashing waves and loud commotion, one could sense a body and psyche being attacked. While an otherwise flawless piece, the closing moments of “Hush” were a little confusing. Toward the end of the work, Felipe Barrueto-Cabello and Melecio Estrella danced a captivating pas de deux. Perhaps the best choreography (and I would go so far to say the best performances) of the evening, this vignette felt like a conclusion. Not the end of the story, but a quieter, more restful place of repose. However, “Hush” wasn’t quite over yet. Instead, what followed was a lengthy song and dance sequence for the main cast, where the lyrics were spoken in syncopated rhythm. Even in light of this grand finale, “Hush” really did seem to end with that aforementioned duet. Perhaps this last group segment is more of a coda - an extra ending; a reaffirmation of the message.